WELCOME TO OLDBURY, LANGLEY AND WARLEY! It is not necessary to be on facebook to view it, but you do need to be a facebook member to add comments and participate fully. The site acts as a forum to contact the website to ask questions, and post pictures or information related to the history of the area. Oldbury is one of the six towns that make up the Metropolitan Borough of Sandwell, just west of Birmingham in the West Midlands. Langley and Warley lie within it. Oldbury became an Urban District in the 1890's with three main townships, Oldbury itself, Langley and Warley. It received its charter in 1935, as the 'Municipal Borough of Oldbury'. 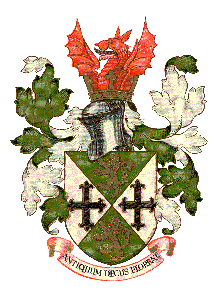 In 1966 it was amalgamated with Rowley Regis and Smethwick as the new 'County Borough of Warley', taking the name of the small township already within Oldbury. 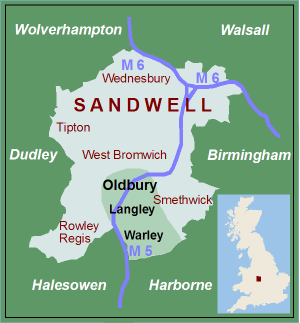 Eight years later the County Borough of Warley was combined with the County Borough of West Bromwich to form the new 'Metropolitan Borough of Sandwell'. All three societies were established at local libraries, and have collected and published information on the history of the area. This website exists to record and make widely available the history of Oldbury, Langley and Warley. It will be ever-changing as we try to cover all aspects of Oldbury's history, using the research carried out by the societies, and the archive of documents and photographs they have built up. We welcome information and questions on the history of the area, and gifts or loans of photographs and documents we can scan to add to the archive. You can contact us by letter, telephone or e-mail. If you love us or hate us, or have [polite] suggestions for the website, please let us know. We are a 'local history' rather than a 'family history' site, but the distinction is blurred, and we welcome family data which so often feed into our understanding of the local area. We are happy to [try to] answer questions on Oldbury and its people arising from your family research, but cannot undertake extensive research on family history.